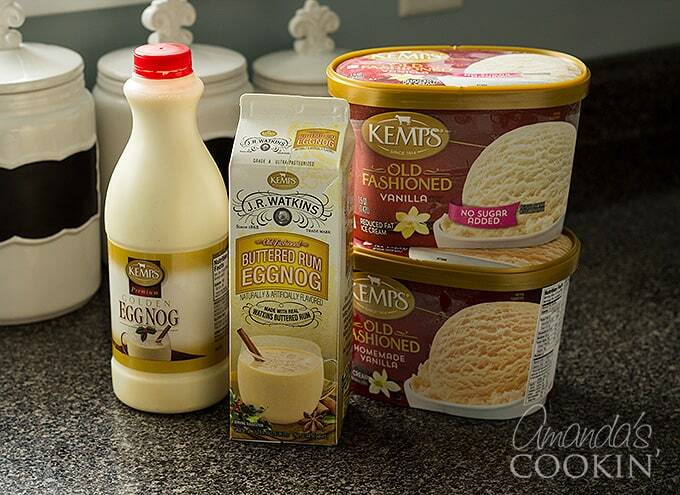 Eggnog Floats: make that carton of eggnog even more festive! There is nothing better than sitting around the living room with the kids, a cup of eggnog in your hand, a tray of cookies on the table, and a blanket keeping your legs warm, while you share and participate in some of your favorite holiday traditions. There are a few special holiday treats that I look forward to indulging in all year round – thumbprint cookies, gingerbread everything, and a glass of eggnog. It’s a definite sign that Christmas is around the corner once you start seeing eggnog popping up in the fridges at the grocery store, and I just can’t help myself but load up on every variety they offer. This year, I was so excited to grab Kemp’s Buttered Rum Eggnog for me and Golden Eggnog for the kids – it’s so nice to have the variety to keep everyone happy and for me to be able to enjoy that delicious buttered rum flavor without worrying about adding alcohol into the mix. 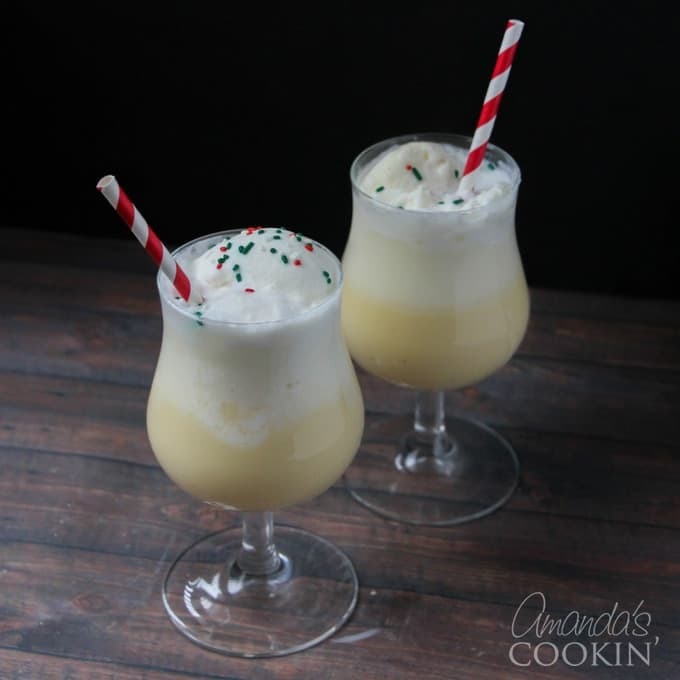 As a fun twist, I also grabbed Kemp’s Vanilla Ice Cream and a bottle of club soda to make a special treat for the kids and I – Eggnog Floats! These eggnog floats are creamy, delicious and slightly unexpected. The fizziness from the club soda helps make that delicious ice cream foam we have all come to expect on the top of a soda float, while not significantly altering that perfect texture and taste of the eggnog. I used the Buttered Rum Eggnog for my float and the Golden Eggnog for the kids, but I would have been just as happy with the Golden Eggnog. 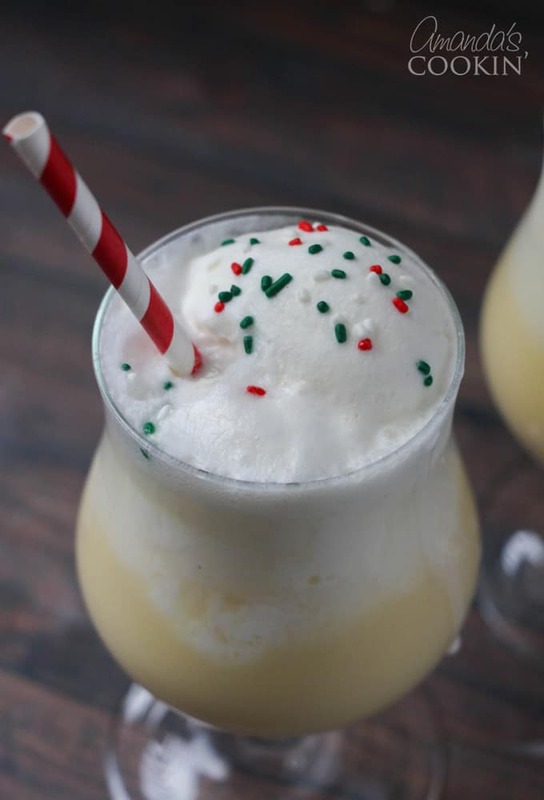 To make these eggnog floats, simply fill your glass halfway with the eggnog. Place the vanilla ice cream overtop of the eggnog and then carefully fill the glass with the club soda. Swirl on some whipped cream and scatter on some sprinkles, if desired, before adding a cute straw and serving immediately. 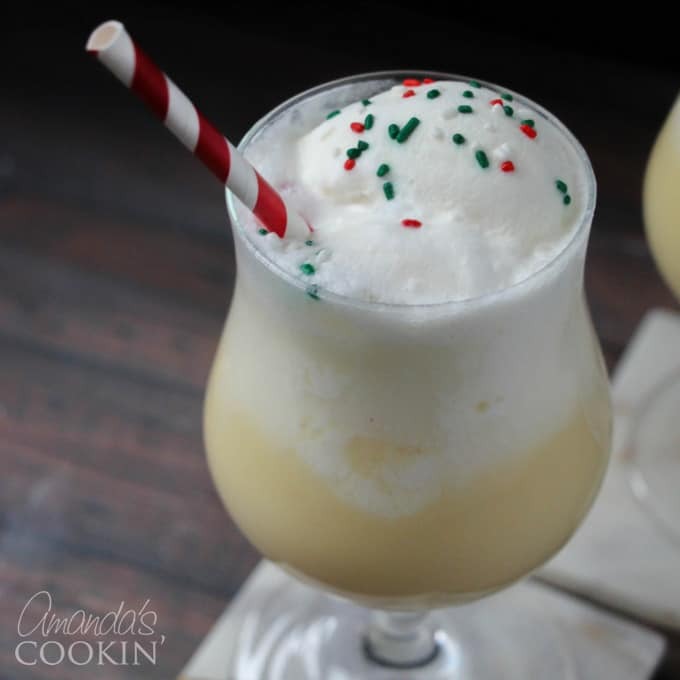 Do you have a delicious eggnog recipe you’ve been dying to try? Today, I’m giving away five $5 coupons for Kemp’s products – you can check them all out here. To win, comment below with what recipe you’d love to try! And for more delicious recipe inspiration, check out Kemp’s collection here. Oh I would love to try their recipe for the Pomegranate Swirl Smoothie! 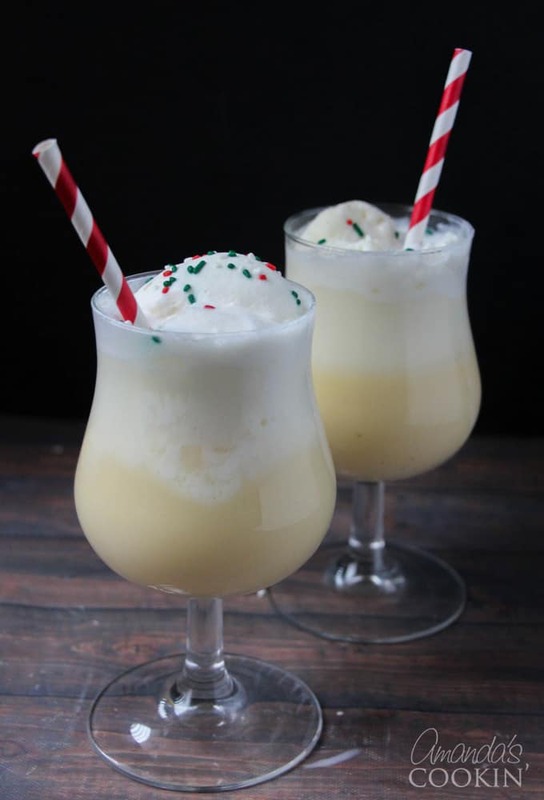 Your eggnog floats look so good and fun for the holidays! 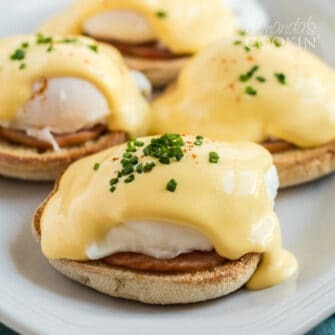 I have to give those a try when family comes! Pumpkin Pie Ice Cream Sandwiches….yum! I would love to try the pumpkin pie ice cream sandwiches.